Truss roof rafters and ceiling joists are typically spaced either 400mm, 450mm or 600mm apart. As such, this leaves a fairly small opening width for your loft hatch and ladder. However, there are still a variety of options to consider, which include both concertina loft ladders and wooden loft ladders. In addition, you could even consider an electric loft ladder. 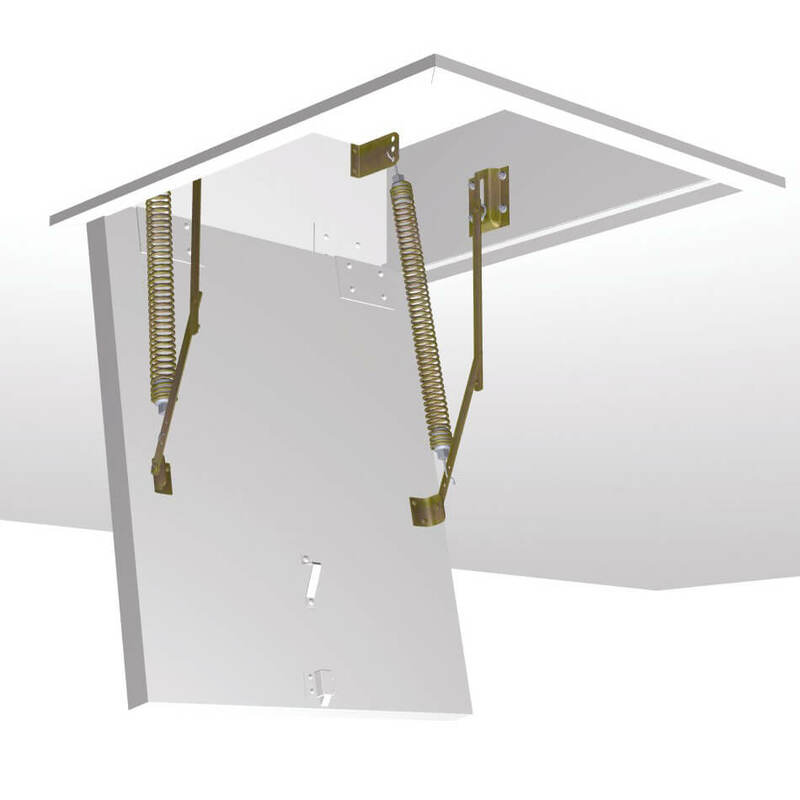 Ceiling joists that are spaced 600mm apart offer the widest range of loft ladder options. Most standard, off-the-shelf loft ladders are suitable for an opening width of 600mm. However, this exceeds the opening space of 550mm. Therefore, look for made-to-measure loft ladders that can be built to perfectly fit your ceiling opening. Wooden loft ladders such as the Designo and Quadro are available for opening widths of 550mm. Both feature the latest technology to provide a highly insulated loft hatch with an airtight seal, using a multi-point locking system (pictured here). Furthermore, the three-part folding ladder also means that there is minimal intrusion into the loft space above. In addition, the Quadro is available for opening lengths as short as 1m (for floor-to-ceiling heights of up to 2.39m). As a result, it is a great option for those wanting a wooden loft ladder but with limited space. Concertina loft ladders are a great option where space is limited. When not in use, they retract so that they can fit into small opening lengths. It also means that they offer minimal protrusion into the attic space above. Furthermore, most are also counter-balanced. As such, they are very easy to use. 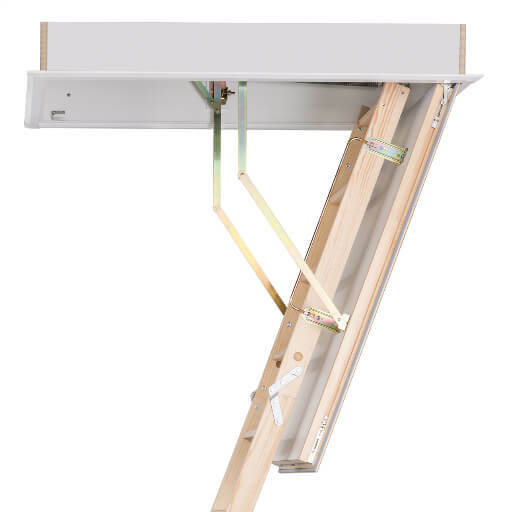 The Ecco loft ladder is the ideal solution where a new loft hatch and ladder is needed. The Ecco features a lightweight ladder with an insulated and airtight hatch box. It is suitable for opening sizes from 80cm long by 55cm wide. Also, the Ecco has a load rating of 150kg per tread. As a result, it is perfect for normal domestic/residential use. However, if you need a heavy duty solution for frequent use, the Supreme (rated to 200kg per tread) is the answer. Alternatively, the Elite is a great option if you wish to keep your existing hatch box and trapdoor, . The Elite is very easy to install. In addition, it is available in a range of widths, starting from 420mm. 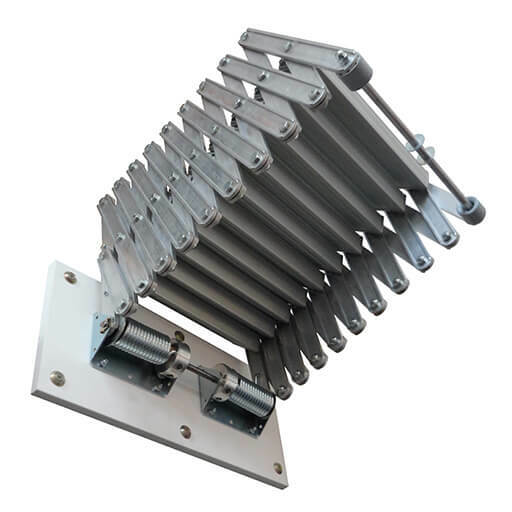 Therefore, it will accommodate a range of different hatch box opening sizes. The Elite also benefits high-strength (200kg per tread), ease-of-use and large treads (with a depth of 140mm). Finally, for those looking for the ultimate in convenience, the Escalmatic electric loft ladder (pictured here) is available for opening widths from just 500mm. It offers style, safety and convenience. Featuring a powder-coated steel staircase, infrared remote control and an insulated trapdoor. Quadro wooden loft ladder. Made-to-measure and highly insulated. Ecco concertina loft ladder. Compact design makes it the ideal truss roof attic ladder. Truss roofs with ceiling joists that are spaced 400mm and 450mm apart can present a challenge with regard to finding a suitable loft ladder. In most instances, the best option is to hire a professional to modify the opening size to allow for a larger loft ladder to be installed. However, that may not always be an option or preferable. 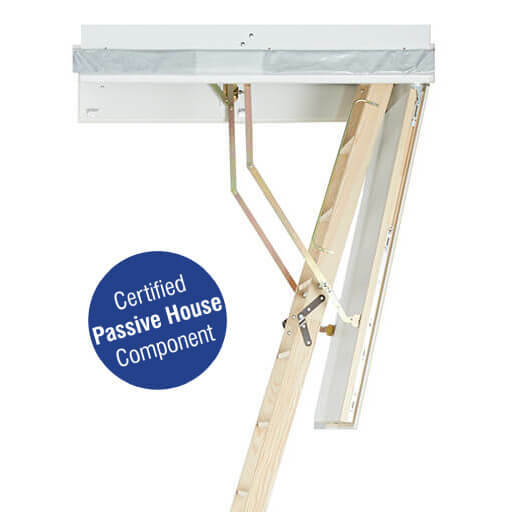 The Piccolo and Piccolo Premium concertina loft ladders are extremely compact, yet strong and robust solutions for very small ceiling openings from 550mm long by 370mm wide. Therefore they are suitable for use in homes with ceiling joists spaced 450mm apart. 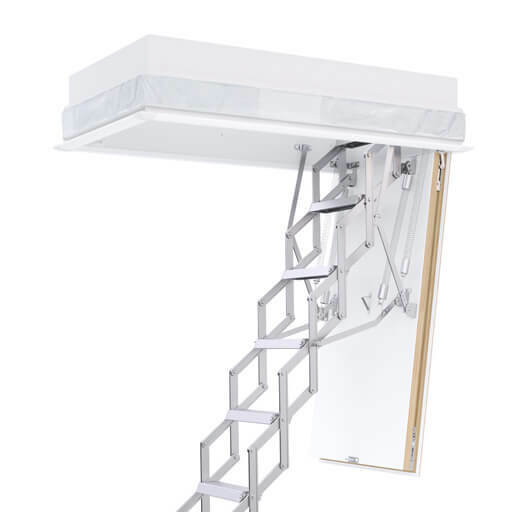 The lightweight aluminium loft ladder is designed to be easily installed within an existing loft hatch. In addition, it is available in standard form (Piccolo) or with a counter-balanced spring mechanism (Piccolo Premium) for enhanced safety and ease-of-operation. Piccolo Premium concertina loft ladder. The Elite can be seen installed in a truss roof arrangement at the National Self Build and Renovation Centre (NSBRC) in Swindon. It is part of the ‘Educational Journey’, which is designed to help people starting self-build projects understand the process and the options that are available to them. 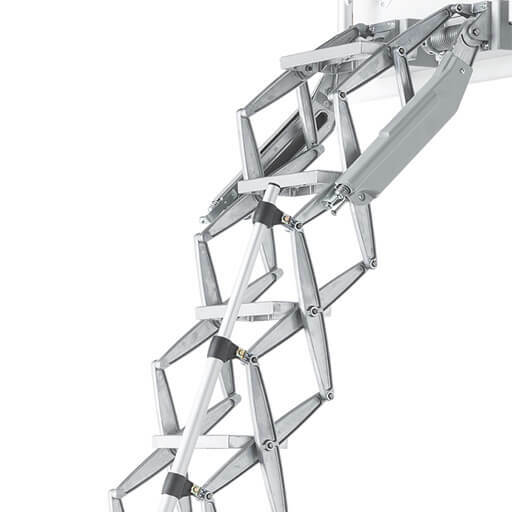 Also on permanent display is the Ecco, which can be found on the Premier Loft Ladders stand (no. 168) in the ‘Trade Village’.